Keep in mind, 5280 Carpet Cleaning and Restoration does much more than carpet cleaning. Many of our customers are surprised to learn that we offer professional tile and grout cleaning for the bathroom, kitchen and anywhere else tile is installed. Tile and grout that is covered with mildew may appear to be ruined, but the professionals at 5280 can help. Before you decide to replace the old, dingy tile in your bathroom, consider having the stains professionally treated. You might be pleasantly amazed at the results. Oftentimes, our technicians can restore the tile to its original appearance, saving you money while increasing the value of your property. Furthermore, tile and grout that is heavily stained and mildewed poses a serious health risk. Areas that tend to be saturated or humid can be a source of mold, fungus, and bacteria. If you do not address these issues, the air quality in your home or office, and potentially the health of your family, could be adversely affected. Thankfully, 5280 provides professional tile and grout cleaning as well as mold remediation services. These services are designed to improve the condition of your living space. Pricing is contingent upon your specific situation so call for a free estimate today. 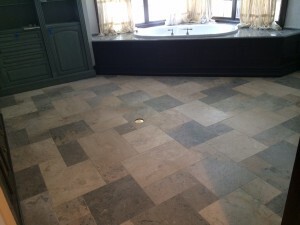 Keep your home or office healthy and happy with the tile and grout specialists at 5280 Carpet Cleaning & Restoration.